Baldwin - Burns Jazz Split Sound Model Solid Body Electric Guitar (1965), made in Romford, England, white polyester finish, sycamore body, maple neck with rosewood fingerboard, original black hard shell case. This is a beautiful custom-color example of the most popular guitar design from the always-eccentric James Ormston Burns, The Jazz Split Sound. This model is an offbeat 1960s classic and especially in this dramatic all-white livery a superbly stylish guitar. Burns instruments were built at the company's Romford, UK factory, and were available here in the US labeled as Ampeg (from 1963-4) and then Baldwin (after that American firm bought the British company in September 1965). This guitar is a very early Baldwin-branded example, identical in every way to Burns-labeled instruments except for a "Baldwin" logo tag cut into the pickguard in place of the engraved Burns name. A handwritten tag under the pickguard dates the electronics inspection to January 22 1965, fully nine months before the Baldwin purchase. This guitar must have sat in stock for some time! It features the earlier Burns-style neck with a single-sided headstock, unbound fingerboard, and finish matching the body. This was changed by Baldwin in mid-1966 to a natural finish, more generic flat-scroll double-sided design. 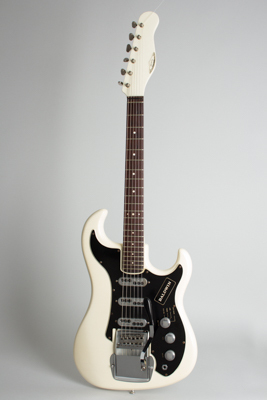 The striking white Polyester finish overall was standard in 1964-5 on several other Burns models but a very rare custom-ordered option on the Jazz Split Sound -- this example has the black pickguard common to all variations of the model by late 1964. The Jazz Split Sound was Burns' midline instrument; professional class, but less expensive than the more dramatically styled Black Bison and Hank Marvin signature guitars at the top of the line. Obviously inspired by the Stratocaster, the JSS has three "Split Sound" Tri-sonic pickups with a rotary control giving four distinct tone selections, including the snarlingly out-of-phase "Wild Dog" and the patented "Split Sound" which combines different half-coils to accentuate bass and treble registers. The lavish Burns "Series II" vibrato system incorporates a floating bridge unit with fully adjustable individual saddles and must rate as one of the best systems of its kind. The medium-scale neck is slim and comfortable with a slightly less round feel than a Fender. This rates as a fine-playing guitar with tons of character and a very distinctive sound; a good value in a professional caliber 1960s vintage guitar. John McNally of the Searchers played an otherwise identical Burns-logo guitar in 1965, but white examples of this model with any brand on the pickguard are quite rare. Overall length is 40 in. (101.6 cm. ), 13 1/2 in. (34.3 cm.) wide at lower bout, and 1 3/8 in. (3.5 cm.) in depth, measured at side of rim. Scale length is 23 1/2 in. (597 mm.). Width of nut is 1 5/8 in. (41 mm.). This is a super nice, all original example of this seldom-seen solid color finish variation. Apart from one partially filled-in finish chip on the treble side of the neck pocket, this entire guitar is very well-preserved. There is corrosion to some of the screw heads and a couple of tuner covers, and the finish shows some typical checking, but the guitar remains all original and complete. Even oft-missing parts like the trem arm and bridge cover are intact. This particular guitar has been played but is well-cared for; the fingerboard has some light divoting and it has had some subsequent fret work and is a very fine player. Includes the original rectangular Baldwin HSC also in very clean shape. Overall Excellent Condition.